Surf News Network, 16 April, 2015. 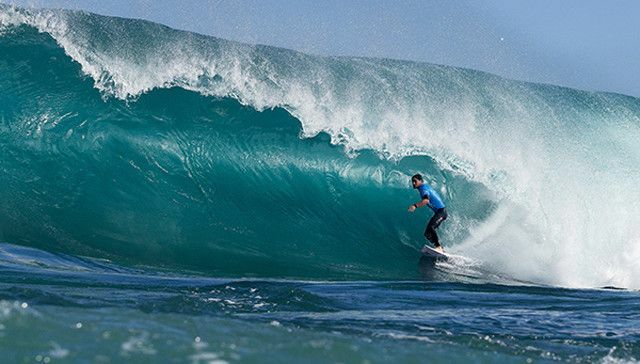 Margaret River – The Drug Aware Margaret River Pro, the third stop on the Samsung Galaxy World Surf League (WSL) Championship Tour (CT) ran through the opening 8 heats of Men’s Round 3 at The Box before moving back to Main Break to complete the Round. The day saw big upsets as ratings leader Mick Fanning (AUS) was eliminated at the hands of wildcard Jay Davies (AUS) and Joel Parkinson (AUS) was defeated by Sebastian Zietz (HAW). The women’s competition also got underway with Round 1 in large surf at Margaret River’s Main Break, where the top seeds were dominant with Carissa Moore (HAW), Stephanie Gilmore (AUS) and Tyler Wright (AUS) all moving directly through to Round 3. Despite the wave of the heat from Kai Otton (AUS) he couldn’t find a score to back up his near-perfect 9.57 in his Round 3 heat against defending event winner Michel Bourez (PYF). The Tahitian found an excellent 8.40 and 6.83 to secure the win and a place in Round 4. “It’s super terrifying out at The Box!” Bourez said. “You have to pick the right waves, you don’t know what the wave is going to do. You take off, hold on and hope that you make the barrel and if you do it’s the best feeling in the world.” John John Florence (HAW), winner of the 2012 Margaret River Qualifying Series event, put on another incredible display of surfing to take the win over Adam Melling (AUS). Florence showed his control and confidence, looking at ease in the waves of consequence while Melling suffered a terrifying wipeout. Sally Fitzgibbons (AUS), Tatiana Weston-Webb (HAW) and Alessa Quizon (HAW) went head-to-head in Round 1 of the women’s contest. The Australian posted a 9-point ride on her second wave for a convincing lead while the Hawaiians trailed. Fitzgibbons looked comfortable in the big waves and went on to back up her excellent score with a solid 7.60 to leave Quizon in a combination and Weston-Webb needing a 9.10. Fitzgibbons’ strong performance moves her directly through to Round 3. Defending event champion Carissa Moore (HAW) faced Coco Ho (HAW) and trials winner Claire Bevilacqua (AUS) in Heat 3 today. Moore posted the first score followed quickly by Bevilacqua. The two-time World Champion caught four further waves for an eventual 12.93 heat total to leave the field in a combination situation. The ratings leader showed great composure and rhythm to moved directly to Round 3 while Ho remained scoreless and will surf again in Round 2 alongside Bevilacqua. Tyler Wright (AUS) looked confident and at ease it the big surf, posting the second 9-point ride of Round 1 and the highest heat total of the women’s competition so far. Opponents Silvana Lima (BRA) and Laura Enever (AUS) were each left searching for two scores and will surf again in elimination Round 2 while Wright moves directly to Round 3. Reigning six-time WSL Champion Stephanie Gilmore (AUS) took to the lineup against Bianca Buitendag (ZAF) and Sage Erickson (USA) and Gilmore stole the win, despite posting just one score in the 30-minute heat.